This summer, there's a new Studio Ghibli movie. According to one reported insider, it could be Ghibli's last. Studio Ghibli is best known for iconic anime like My Neighbor Totoro, Grave of the Fireflies, and Kiki's Delivery Service. Last year, the creator of many of Ghibli's best known works, Hayao Miyazaki, retired from making feature animated films. The purported insider told Japanese site News Cafe that Ghibli's latest release, When Marnie Was There, "seems like it will be the last [from Studio Ghibli]." The article appeared on Rakuten, one of Japan's largest web portals. That being said, this is an unconfirmed rumor. As the insider explained, there was scuttlebutt of the studio's dissolution last year after Miyazaki retired once completing The Wind Rises. Then, this past spring, longtime Ghibli producer and studio co-founder Toshio Suzuki also stepped down from producing films. He is now Ghibli's general manager. "From here on, it appears as though this won't be a studio that makes new works, but instead, manages its copyrights." So, Studio Ghibli won't be creating new animated works, but rather, making money off the anime its created so far. The insider added animated films required tremendous amounts of money, so there is pressure for the films to be successful so Ghibli can cover its costly production expenses as well as, I'd imagine, remain healthy and profitable. By the insider's count, each film apparently needs to make at least ten billion yen (US$100 million) to cover all its production costs as well as, I'd imagine, turn a healthy profit. Even with a relatively small staff, the insider puts Ghibli's annual labor expenses at supposedly two billion yen ($19.7 million). Note: These numbers are unconfirmed. Last fall, the Asahi Shimbun, one of Japan's largest papers, reported that while other animation studios have shipped jobs overseas to save money, Studio Ghibli had hired more permanent full-time employees in Japan, making the films incredibly expensive to make. Asahi reports that even though The Wind Rises had made 9.23 billion yen ($91 million), the film had apparently yet to turn a profit. The Tale of Princess Kaguya, apparently, cost even more to create. "The Tale of Princess Kaguya from director Isao Takahata made 5.1 billion yen ($50 million), and for the studio, it was a flop," the source told News Cafe. "There's no choice but to dissolve the studio, because it's unable cross the high hurdle of announcing a new film on an annual basis." A bright point is that Goro Miyazaki, Hayao Miyazaki's son, is directing Ghibli's first animated TV series, Ronia the Robber's Daughter. The computer animated series is a co-production, however, with Polygon Pictures and will debut this fall. The dark cloud is that back in 2010, Hayao Miyazaki did mention breaking up the studio. "Suzuki-san is making a dissolution program for Ghibli," Miyazaki told Cut Magazine (via Bleeding Cool and Nausicaa.net). "No joke, we talked about it the other day. For example, Ghibli should be able to continue with about five staff members as a copyright management company even if we smash the studio. 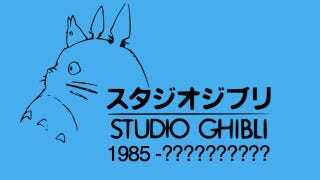 So, Ghibli can say 'We stop film production. Goodbye'. I do not have to be there." The latest Studio Ghibli film When Marnie Was There was directed by Hiromasa Yonebayashi and recently released in Japan. Let's hope it's not the last Studio Ghibli film. Kotaku has reached out to Studio Ghibli regarding this latest rumor and will update this story should the studio comment.